The display of sponsor's signage at an event is now a common occurrence. An objective of all Event Directors should be to satisfy sponsors sufficiently enough so that they will provide further support in the future. It is important to uphold the reputation of the sport and recreation industry and to demonstrate that sponsorship is a feasible and practical means for companies to achieve promotion of their products and services. It is a disservice to the who industry if sponsors are let down badly. These factors increase the likelihood that signage will create exposure opportunities for the sponsoring company. In particular, if the sponsor's signage is clearly visible in a photo in a newspaper or in a news report on television it is a major success for both the sponsor and the event. There is also success if an excellent photo is created with sponsor's signage in the back ground that may be used over many years in club magazines and promotional documents. Rectangular signage made from corflute, a material that looks like corrugated cardboard except it is made from plastic. The size of such signage depends upon the agreement struck between the Event Director and the sponsor. 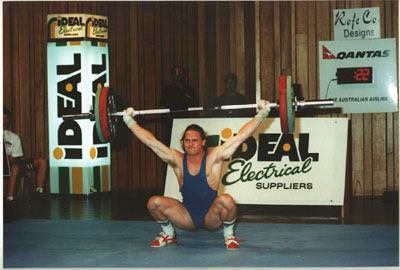 In Photo 1 above, the signage directly behind the Weightlifter is made from corflute and is 3 metres long by 1½ metres high. It is attached to a wooden A-frame to ensure that it secure. Corflute is suitable for indoor use mainly as it is a very light and flexible material and would be at risk of bending and blowing down on windy day if used outside. Weathertex is a stronger material that is often used for outdoor signs or if there is a likelihood of it being bombarded with balls. The material is a composite that is compressed. Although it is hard wearing, if roughly treated, it may suffer damage to corners or become scratched. In Photo 1 above, the Qantas sign is made from Weathertex because it supports the weight of the electronic countdown clock. A plastic banner painted with sponsors name and logo is another popular type of sign. It is usually fixed to walls or fence or strung between objects and trees using ropes that are a part of the banner itself. Sponsor's signage can also be illuminated. The construction consists of a wooden or metal box with one panel replaced by opaque plastic material. The sponsor's name and/or logo is affixed with vinyl lettering or is painted on the opaque plastic material. The box has one or more fluorescent light tubes inside to provide a diffuse light behind the opaque plastic panel. Signs of this nature are effective for indoor but of course the require power. In Photo 1, the box on the left of the Weightlifter is just such a construction. Whatever the type of signage it should be kept clean and undamaged for future use. It is often the case after the event, that in the rush to pack down the event, signs are damaged. A good policy is for the Event Director or someone has a similar understanding of the importance of the signage be responsible for its safe removal.